Rare first edition of Mitchell's map of Philadelphia. 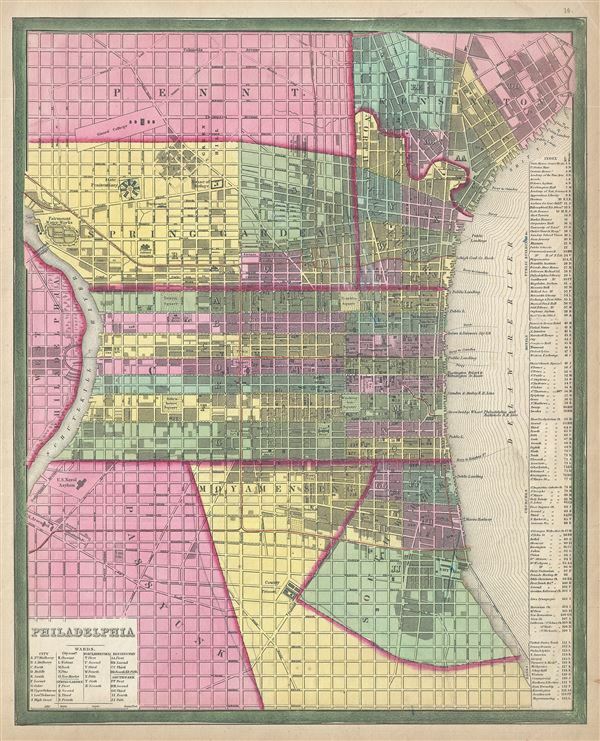 This is a scarce first edition example of S. A. Mitchell and H. N. Burrough's 1846 plan or map of Philadelphia, Pennsylvania. This hand colored lithographic engraving depicts the city of Philadelphia in superb detail at the street level including references to the individual buildings, trains, canals, and roads. Colored coded with pastels according to city wards, it includes nice details in the Delaware River, noting ferry crossings, sand bars, currents, and steamboat routes. A table to the right of the map proper, in the midst of the Delaware River, assigns Public Buildings, Hotels, Churches, and Banks numerical codes. This is a rare transitional map produced by the mysterious engraver H. N. Burroughs, whose work for the Mitchell firm appears in 1846 between that of H.S. Tanner and Mitchell himself. Ristow notes, 'Nothing is known about Burroughs, but he was undoubtedly an employee or associate of Mitchell.' His fine and detailed work appears only in the hard to find 1846 edition of the Mitchell's Atlas. Issued as plate no. 14 in the 1846 edition of Mitchell's New General Atlas. Rumsey 0537.015. Philips (Atlases) 6103.